You'll find quite a few Yosemite National Park apps available for your mobile device. Some of them look good in the app store but don't work out so well when you get them installed. To help you find the ones that work best for visitors, the apps below were all tested and proven before they were included. Here's the problem: Many of the Yosemite apps rely on your mobile device having a stable enough wireless connection that you can access the data you need to make them work and enough data available on your plan to get what you need. Added to that, many parts of the park have little or no cell phone signal, no matter what carrier you use. That makes it likely your app will just refuse to work when you need it most. Your only defense against that is to find apps that have an offline version and be sure they're downloaded before you go. 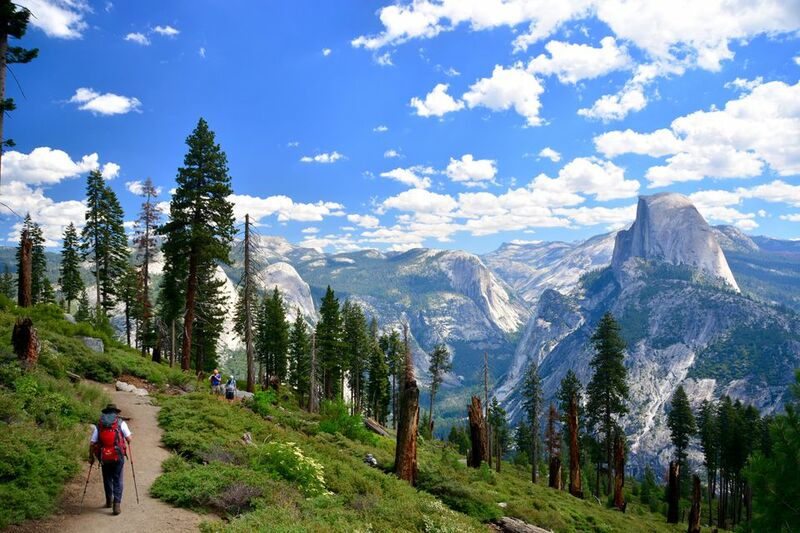 While you're in the planning stages of your trip, you can use the Yosemite vacation guide. After that, here are a few apps to download before you go that will help you enjoy your visit. If you like to use apps to plan or assist during your trip, there’s a free app that provides a lot of information about Yosemite. It was created by Chimani, who make apps for many of the big national parks, for both iPhone and Android users. Chimani's strength is that it’s self-contained, downloading a lot of data to your mobile device instead of accessing it on the run. That's the most reliable way to handle an app for a place like Yosemite, where mobile phone signals can be weak or non-existent. You’ll find a lot of information in the Chimani app, with 34 icons on four screens at the top level. Some parts of it are more useful for advanced planning than use in the park, but unfortunately, they're mixed with sections better used in-park. In fact, navigating the app may be harder than finding your way around on the ground. Some icons are also hard to decipher. If you like to use an app while traveling, Chimani has a lot of offer and is the best Yosemite app currently available. However, if you’re good enough with a map to figure out where you are, you may find the old-fashioned paper map you get at the entrance an easier choice. However, if you want to go on a serious hike or just go on an easy hike in Yosemite Valley, Chimani is not designed to be a serious trail-finding tool. Outdoor equipment retailer REI is a good place to get your equipment, but that's not all. They also make the REI app for national park visitors. It uses your phone's GPS capabilities to track your position, even when you don't have voice or data service. It also includes lots of hiking and trail data and it has a family-friendly section. And Yosemite isn't the only place you can use it. The app also includes several national parks. The Yosemite GyPSy Guide tour will set you back a few dollars, but it's well-rated and gives commentary automatically as you drive around. It may even lead to a few things you might find on your own. AllTrails is one of the best apps for serious hikers, with lots of options and information - and they cover more than just Yosemite. If you go to Yosemite in the spring and are one of those people who just have to know the names of things you see, check the Yosemite Wildflowers app from High Country Apps. Photographer's Guide to Yosemite from Michael Frye can help you find some great places to take photographs and how to make them look even better. Birders may also enjoy using Merlin Bird ID from Cornell Labs to identify the flying creatures they see as they travel.